Professional, confidential, comprehensive, and effective treatment. Recovery is just a phone call 248.358.8508 or an EMAIL away. Biting The Hand That Feeds (2005), Mr. Shulman’s sophomore effort, is a must-read companion to his first book on shoplifting addiction. The U.S. Chamber of Commerce has estimated that at least 75% of Americans commit some form of theft or other dishonesty in the workplace and that most do so repeatedly. 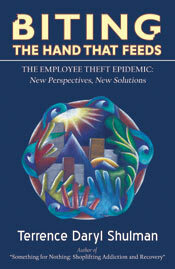 This is the only book that approaches the employee theft epidemic from a direct, humanistic, and first-person perspective. Would you be surprised to learn that it’s often the star-employee who’s led out in handcuffs? Mr. Shulman includes case-study composites of clients he’s treated as well as interviews with actual store and company owners and loss prevention personnel. How honest are you at work? How honest are your fellow co-workers and even your bosses? Read this book and find out! Part One highlights stories of those on various sides of the employee theft epidemic: the people who steal, the loss prevention people who try to stop them, and the store/business owners: a human face on theft. Part Two provides a guide to various reasons why people steal from work, important data, statistics, and the challenges and issues that arise: new perspectives. Part Three provides some progressive strategies to reducing and treating employee theft: new solutions. Part Four includes exercises to help people stop stealing and move toward greater peace and wholeness: recovery. Part Five focuses on other related topics. My first book “Something for Nothing: Shoplifting Addiction and Recovery” (Infinity Publishing, 2004) took seven years--on and off--to write and publish. As with shoplifting, this book is about a similar epidemic--employee theft: both are far more than just moral, financial, or legal issues. Both books are intended as personal and professional offerings. As a therapist, attorney and consultant--and as one who intermittently shoplifted and stole from work from 1982-1990--I hope I have something unique and valuable to add to a new conversation on employee theft. In September 2004, I appeared on The Oprah Winfrey Show to discuss my book and the topic of shoplifting addiction. Since then, my private counseling practice specializing in treating theft addictions and disorders has blossomed. Currently, I am awaiting an interview with ABC News’s 20/20 on the topic of shoplifting addiction, to be aired later this summer. And, finally, I am co-organizing and co-presenting at The First International Conference on Theft Addictions and Disorders in Detroit in the early fall. I knew my second book would be on employee theft. I figured: one controversial topic at a time. My first book emphasized shoplifting for several other reasons. First, roughly 75% of my own theft behavior took that form, compared to about 25% employee theft. Second, I’d met more people--personally and professionally--with shoplifting problems. Third, there was more interest: I’d had many more interviews in print, on radio and on TV about shoplifting than on employee theft. Finally, I didn’t view employee theft as seriously. My consequences from shoplifting--two arrests, nearly having my law license withheld, among others--seemed more severe than losing a few jobs due to employee theft. Indeed, in re-reading my own story, I was shocked to realize during my entire course of therapy and conversations with family and friends, I completely neglected to share about my employee theft behaviors. As I did more research, I found the statistics on employee theft staggering. I now see it very seriously. As Director, I got to see my staff and the management from a middle-ground view. I got a closer glimpse of the politics of the workplace and how the bottom line is affected on every front. The pressures for everyone—including me—were enormous. By the time I resigned as Director in 2000, I realized I’d have to be self-employed one day—not only to reduce my temptation to steal again but to chart a path toward my higher potential—financially and emotionally. I will not be re-telling my life story here. If you are interested, you can read that in my first book. But a lot has happened in the two years since. Increasingly, I’ve worked with more people seeking help for chronic employee theft behaviors. As shoplifting recently has gained some relative acceptance as a potentially addictive and treatable behavior, people who steal from work have begun to seek help, too. As in my own case, many people I’ve worked with have both shoplifted and committed employee theft—concurrently or at different stages. I’d estimate 50% of my clients have engaged in both forms of theft—to varying degrees; roughly 25% only shoplifted; roughly 15% only stole from work; and about 10% have done either credit card fraud or stolen from family, friends, or other individuals. Does the kind of theft make a difference? What’s worse: $5,000 worth of CD’s shoplifted from stores or $5,000 worth of stamps and office supplies from work? Is stealing money worse than stealing items? It’s all problematic for everyone! I hope to drive this point home. Over the last two years I’ve also explored work as an independent loss prevention and corporate consultant. I thought if Frank Abagnale of “Catch Me If You Can” can turn his life around from a master fraud to a master consultant, so can I. In my research and in my discussions with those in various relevant fields, I’ve found most people don’t care why people steal from work. They view any attempt to understand or explain theft as excuses. I have known countless people who didn't fully recognize they had a problem as well as those who knew they did and wanted to stop but didn't know how or where to go for help. I have a shared interest in seeing a reduction in theft; however, I have some different ideas about how to get there. Employee theft is a hot potato right now. If the actress Winona Ryder dominated the headlines in 2002 during her shoplifting trial, we’ve had more than a decade of headlines on white collar crime and employee theft--from Enron to Martha Stewart. Most people are sick of excuses. But it’s not just the big stories that ought to concern us. Every day, employee theft takes a bite out of us all. Businesses lose 20% of every dollar to employee theft. 20% of employees are aware of fraud at their companies (including theft of office items, false claims of hours worked, and inflated expense accounts). The average time it takes for an employer to catch a fraud scheme is 18 months. 55% of perpetrators are managers. 44% of workers say their companies could do more to reduce fraud. The U.S. Retail Industry loses $53.6 Billion a year due to employee theft. 60% of companies have staff trained to deal with fraud and ethics issues (up from 30% in 2000). The U.S. Chamber of Commerce estimates that 75% of all employees steal at least once, and that half of these steal again and again. The Chamber also reports that one of every three business failures are the direct result of employee theft. In employee surveys conducted by academics, 43% of workers admitted stealing from their companies. The FBI reports that employee theft is the fastest growing crime in the United States. We need not worry solely about an enemy abroad taking a toll on our economy. We have met the enemy: it is us! It’s either the worst time or the best time to start talking about this topic in a new way. I’m hoping it’s the right time. Janis Fernworn, 45, was the treasurer for her church. Over several years, she embezzled at least $700,000. She appeared to have no history of alcohol, drug, or gambling addictions. She is married, has five children—two of them adopted—and lives in a wealthy suburb. "I am horrified at what I did to my church. I pray they will someday forgive me for these repugnant crimes." Mrs. Fernworn and her husband had been members of the church for 23 years and her husband had served on the church's board. According to prosecutors, Fernworn wrote checks to herself from church funds. She tried to hide this in various ways but was eventually discovered. Fernworn said her embezzlement began when she and her husband were three months behind in paying their home mortgage. "I still remember the first time I wrote a check to myself that wasn't legitimate," she said. "My hands shook so badly, I was almost unable to manage the writing. I felt that I had exhausted all other possibilities. I don't know when it was that the embezzlement switched from easing the true need to needing the ease, but it didn't take long before the hole was so big that I couldn't face making it better." Fernworn swore that she kept the embezzlement from her husband, who has not been charged. The judge found it hard to believe he didn't know. "How could anyone live under the same roof and have $700,000 of tax-free income and not have clue Number 1 that something strange was going on?" The church pastor asked the judge to send her to prison not out of revenge but saying "it is a price she must pay." Because she had no prior offenses, her sentencing guidelines called for no more than 9 months in jail. The judge exceeded that and sent her to prison for 5-10 years. If you felt the judge in this case didn’t give Janis Fernworn enough prison time, this book may not be for you. If you felt: what’s the big deal?—this book also may not be for you. Or, maybe, after reading this book, you will see things differently. If you are able, or are willing, to see the tragedy for everyone—for Mrs. Fernworn, her husband, her kids, the church members, and the community—and new ways of reducing theft, then this book is talking to you. We’ve all heard similar stories of the person fired from his or her job for embezzling some “ungodly” amount of money or stealing goods and product. Sure, there are greedy folks, plain thieves, and career criminals in our work force. But mostly, employee theft tends to happen a little at a time. Someone’s vulnerable--there’s a financial or emotional stressor, a conflict at work--and a line is crossed. Next thing you know, a star employee is hauled away in handcuffs. We scratch our heads, wondering: What were they thinking? They didn’t actually think they could get away with that? The answer usually is: They weren’t thinking. They got hooked. Employee theft can become addictive! There are plenty of books out there which quote facts, statistics, cursory reasons why people steal from work, and what can be done to reduce or prevent it. They may certainly be of value if that is primarily what the reader is looking for. Most are written by “experts” in the security and loss prevention fields--the typical readers are store and business owners and fellow security and loss prevention folks. This book is not about excusing employee theft. But it is a different kind of book. My intention is to make this topic relevant, provocative, and urgent for everyone! Have you ever committed employee theft? Yes or No? How would you define employee theft? Is it only the blatant embezzlement and/or stealing of valuable assets from work? Is it a matter of degrees? Be honest, have you ever done any of the following without the expressed permission from an employer? Padded an expense account or report? Made personal phone calls on company time? Used office supplies for personal use? Borrowed funds for personal use? Made personal copies on the copier? Failed to report accounting/payment errors in your favor? Used the company car for personal business? Ran errands on company time? Chances are, you are in the 75% or more of all employees who have stolen from work. What did one loss prevention worker say to another loss prevention worker? Imagine facing a problem like cancer or war. Indeed, we do so almost every day. We certainly need to take action to confront and arrest the effects of a disease or conflict in progress, hopefully learning more advanced and effective techniques each day. Likewise, it seems to me we must also adopt a comprehensive approach if we hope to make a lasting difference. If we know more about why cancers take root and why wars begin, wouldn’t that be valuable, too? We constantly research genetics and lifestyle choices to learn more about how diseases occur. We study war history to prevent history from repeating itself. Indeed, we educate about “aftercare” treatment with diseases to best insure they don’t return; we speak much of what is needed—and, hopefully, take measured steps--to “keep the peace” long after the fighting has stopped. Even in our “war on drugs”—to the degree it has been effective—we’ve taken at least a two-prong approach: tough enforcement and penalties along with more education and treatment. Some argue there’s not enough energy to do both. Others say doing both sends mixed messages. And others are thinking “outside the box” about causes and solutions. Imagine you are someone who steals from work. You come to work each day with butterflies in your stomach, on edge, looking over your shoulder, wondering if today may be the day you are discovered. Every time your name is called, or the boss asks you a question, your gut tightens. Is this any way to live? Part of you wants to come clean, spill the beans, and stop the madness—but there’s something that seems to stop you. Was this the life you chose? Imagine you are a store or business owner and you are so busy you don’t have the time to check everything out. You do your best—in your mind—to treat your employees well and you think you can trust the people you employ but you can’t. It’s heart-breaking. Imagine you are a loss prevention worker and going to work each day is like coming into a war zone. You can’t let your guard down—you’ve been surprised and shocked before. You have become jaded and cynical. You long for the day when work is easier but you crave the challenge, too: you get a high from catching people who steal. When shall we experience our “crash moment” where each of our lives intersects and we feel each others’ struggles in a new way? Most companies just fire any employee who steals. I’m not saying acts of theft should go unpunished. But if nearly two thirds of employees are stealing on some level, we can’t just fire everyone. Companies risk losing people who may not be easily replaced. They also risk losing a human touch. Also, an employee fired for theft will likely go to another company and steal due to the increasing reluctance of all companies to offer any prior work references, good or bad. We’re living in an age where we “pass the buck”--“it’s not my problem anymore.” But we all live in the same world. My hope is with more open open-minded conversation and more resources available, we shall see a transformation in the awareness of how we view theft behaviors. Then, and only then, will we be able to develop true loss prevention strategies and attain a more honest society and world. I believe we develop beliefs throughout our lives which become our truths. These beliefs fuel shoplifting and stealing. Most people are unconscious of their thoughts or they may be prone to "stinking thinking." All behavior--whether freely chosen or stemming from an addictive-compulsive mind set-originates from our thoughts, beliefs, and values. Strong feelings bolster this foundation and, eventually, we act out habitually or with hell-bent righteousness. I know a woman whose father shoplifted. "He used to tell us: 'It's there for the taking.'" What beliefs would you guess are behind that statement? Would it help to know her father was a war veteran who felt less than heroic, was discontent with his own life choices, and felt powerless, passionless, resentful? How about the well-to-do woman who has been arrested twice for shoplifting dolls twice in the last year since her child died? This book is a call to action-not about making excuses! We've lost our compass. We need to look at ourselves in a new way. We point the finger at the world, everybody else. Or we point our finger at ourselves. "Thou shalt not steal" is more than a commandment. It is a prerequisite to a life that works: for each of us and all of us, individually and collectively. With most addictions, we focus on dishonesty as a by-product of the addictive lifestyle. Here, we go to the core: we explore dishonesty-in the form of shoplifting and stealing- as the primary manifestation of unresolved issues and erroneous, destructive beliefs. This book is like no other. Hopefully, there is something here for everybody: shoplifter, family or friend, therapist, judge, probation officer, attorney, police officer, store or business owner, minister, or student of human behavior. I ask you to take your new insights and apply them to make a difference in the world. © 2018 The Shulman Center, All rights reserved.